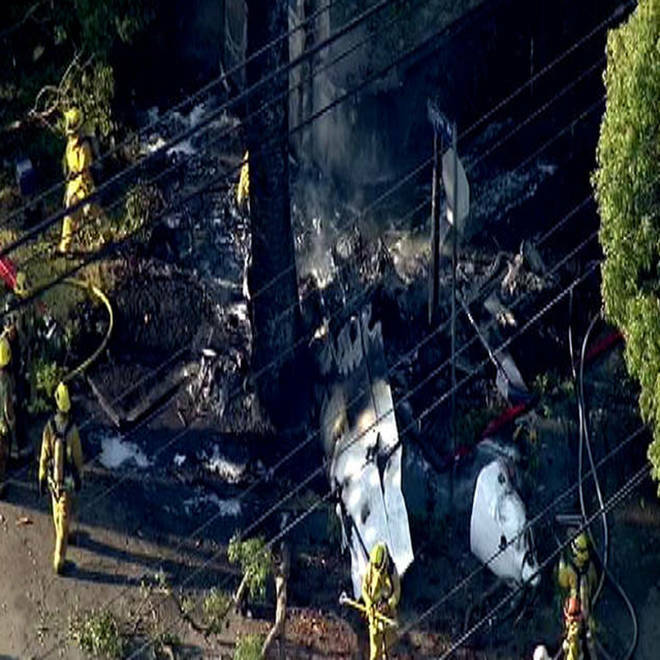 The scene of a small plane crash in West Los Angeles. A small fixed-wing aircraft crashed in a residential neighborhood on the westside of Los Angeles on Friday evening, and one person has died, according to authorities. The victim's age and gender was not immediately known, fire officials said. No other victims have been discovered. The pilot of the single-engine Cessna 210 declared an emergency around 6:10 p.m., shortly after departing Santa Monica airport, which is about 3 miles northeast from the site of the crash, according to Ian Gregor, with the Federal Aviation Administration. It was not immediately know why the pilot signaled an emergency. The plane is registered to a Santa Monica resident, Gregor said. Aerial video showed smoke rising from the scene, a residential neighborhood in West Los Angeles, about 1 mile southeast of UCLA. The plane appeared to crash near homes but no structures were involved in the crash, officials said. A blackened, broken-apart plane appeared in the roadway, and ground video showed a scene cordoned off with yellow tape and dozens of fire and police officials. Los Angeles firefighters were on the scene spraying down the wreckage, which appeared to be partly in an intersection. An alert sent out by the Los Angeles Fire Department at 6:18 p.m. gave the address as 2111 Glendon Avenue. A man who said he lived less than a block from the scene spoke on air during the NBC4 News at 6 p.m. via phone. "I saw a small plane go right overhead. It literally clipped the power lines right behind myself. Instantly, I heard it hit the ground and there was smoke. We ran over there … the plane was already engulfed in flames, the tree was on fire," said the neighbor, who gave his name as Matthew. He added that there was "high air traffic" in the area going into Santa Monica Airport. "They usually go in that direction, but obviously never that low," Matthew said. This is a breaking news story, please check back for more details.